A shining tribute to the spiritual birthplace of house music, the 'US House Legends' compilation offers a selection of iconic house tracks from some of the most inspirational and influential producers in the scene, including faithful remixes from today’s artists. The album evokes the spirit of a time when originality and unity defined house music. The album captures the sounds developed and played out in such iconic clubs as Warehouse Chicago & Paradise Garage New York by pioneers like Todd Terry, Victor Simonelli, Frankie Knuckles, Cevin Fisher and Steve ‘Silk’ Hurley. It celebrates the artists and tracks that have changed music forever and the new generation of producers following in their footsteps. 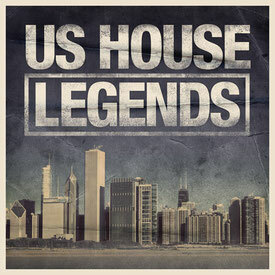 It provides 26 classic tracks and remixes, including Todd Terry’s ‘Jumpin’, revitalised by Iban Reus, four time GRAMMY® Award-nominee Steve ‘Silk’ Hurley’s landmark UK chart-topper ‘Jack Your Body’, given a crisp and techy rework by Doorly, and Victor Simonelli’s Solution – ‘Feels So Right’, updated by UK House duo WhiteNoize. It’s out now on Toolroom Records.